So i had my mind on Saturn the last days, but it is not the only planet in the skies those days. Venus is incredibly bright on the skies those days but it is so bright that I didnt manage to take a picture of it. I need to try it again some day. But Jupiter is there. High up and just enough brightness to take amazing pictures. So in my Saturn imaging session, some nasty clouds were covering it. 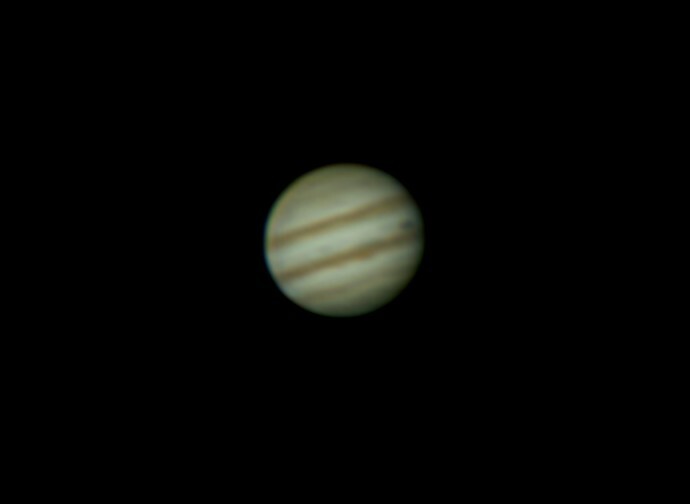 So I just for a moment aimed in Jupiter and took some shots of it. For my amazement the result was very good. Way better than Saturn. I believe it is as of yet my best planetary picture. No moons though. But no chromatic aberration and not much atmospheric disturbance. I was unhappy with my featureless Saturn, so I decided to try again. This time, I started with some more fine tuning collimation. It never seems to be right in the dead center. But I believe it improved quite a bit. Also I followed closely some collimation techniques. 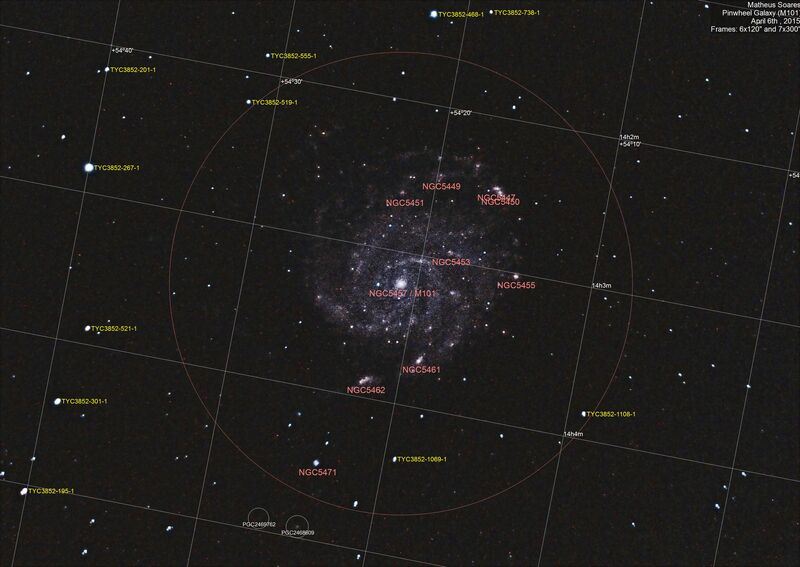 Chose a more suitable star on the Zenith, not to bright, not to dim. Zoomed in as much as I could and work my way in. Another difference this time, was that I decided to take way more frames. From a thousand last time, I changed to 6 thousand. Why is that? Planetary imaging suffers a lot with atmospheric disturbances, since we are trying to see such tiny details. So we use the technic called “lucky imaging”. Where we take a gazillion of pictures, but only actually uses a small fraction of it. Only the lucky pictures where the atmospheric disturbances are minimal or nonexistent. It is, of course detected automatically. Trying to select the couple of hundred pictures on a several thousand set of pictures would take forever. Another difference in the acquisition was ISO/Gain and Shutter speed. 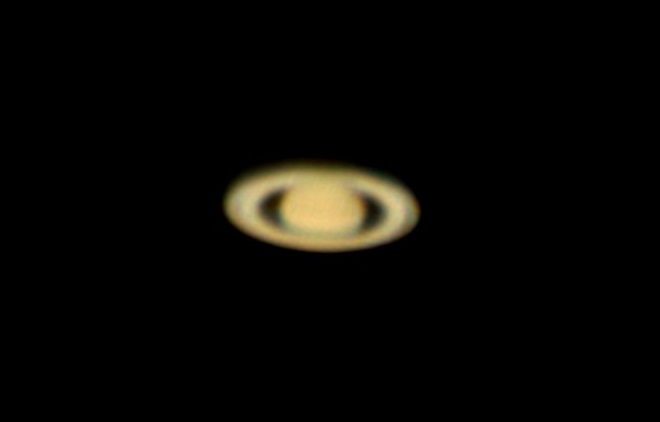 I have read in a planetary imaging tutorial that longer exposures and lower ISOs are better to spot better details. So I’ve tried that as well. Although it still not a very good sharp focused picture, it looks way better than the previous one. It is possible to see some features on the rings, and the color difference. Almost possible to see the gap on the rings what should appear there. It still far away from a good picture, but with practice and experimentation, I believe I can improve it even more. 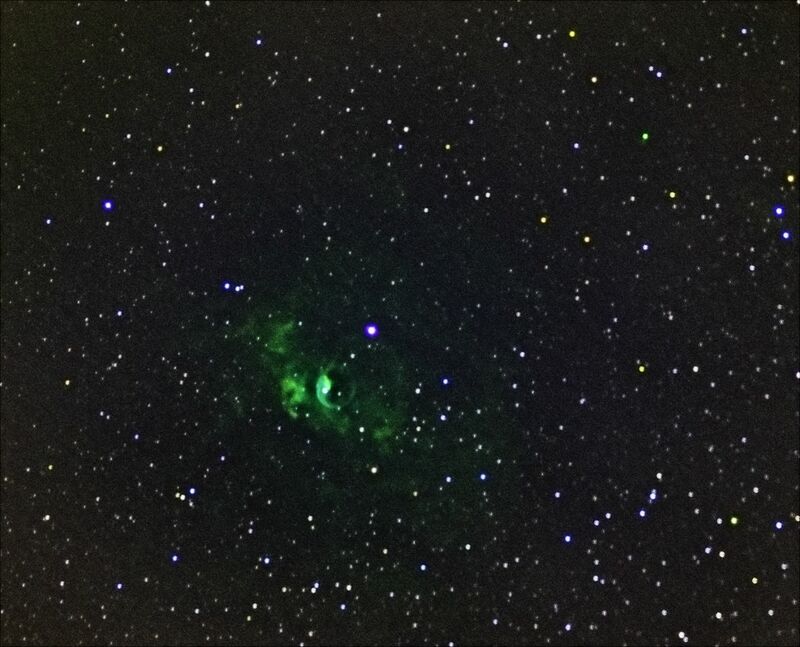 This picture I took before I got my new equipment, using still my DSLR Canon 60D instead of the CCD Atik 450. I was planing to make more sessions and get the double of frames before editing and posting this picture. But now, I dont want to use the old camera and old setup anymore, so I guess I won’t be getting more frames for this picture. After the disaster with the dew, I used the Dew shield that I had forgotten when I did my first session. And I was able to take way more pictures before the Dew started affecting it. 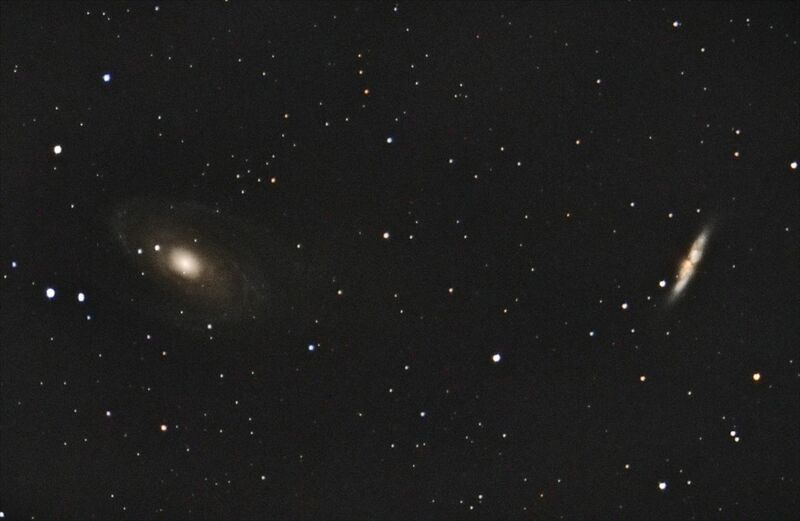 And with the Maxim DL and the auto-guiding at errors bellow 1 pixel, I manage to take very good frames. The result is amazing. Very long exposures gives such an amazing result. And I could catch several tiny galaxies on the background, where IC4263 in the upper right corner is the biggest of them, but there are 6 other tiny galaxies visible on this picture. 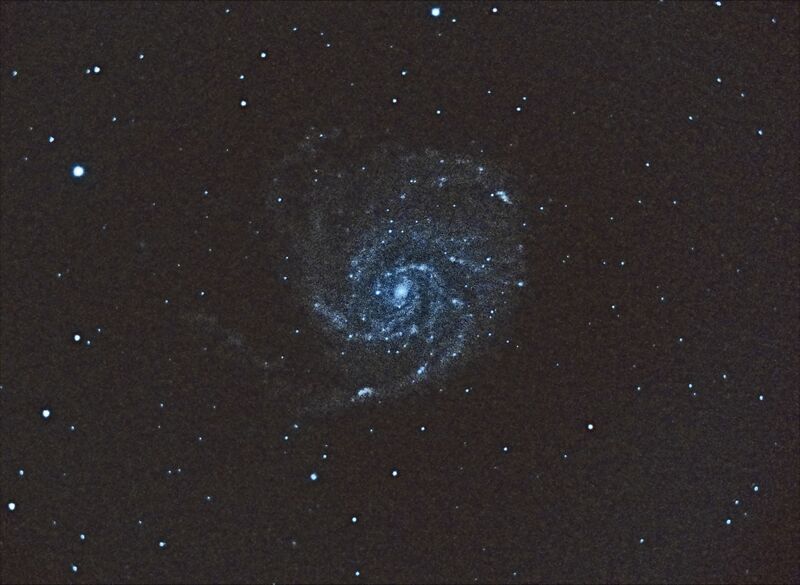 Two month ago I start checking for some new equipment to upgrade my telescope. And today I finally got everything and could install it. I bought a Hyperstar setup, a CCD astronomy cameras, and some filters and accessories. Took a long time but now everything is here. A Hyperstar setup or a Schmidt camera is basically introduce your camera on the place of the secondary mirror. 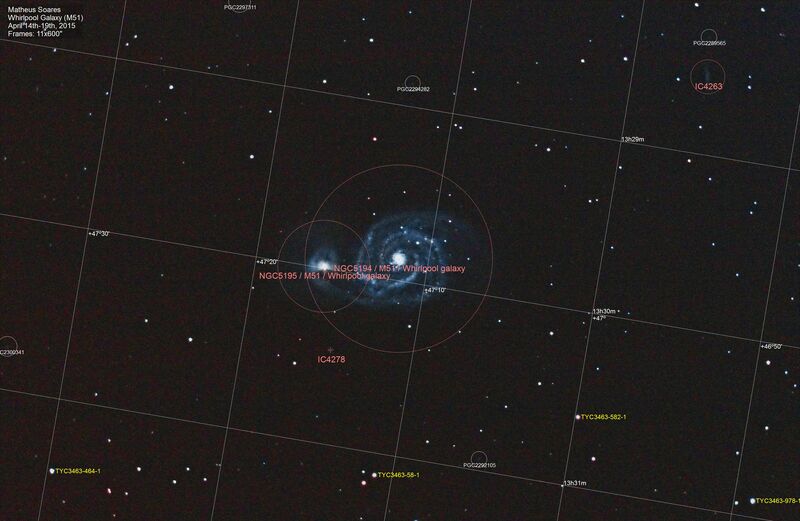 This have the advantage to gather 23 times more light (for my Celestron 8″). It transforms the f/10 system to a f/2. So a 30 seconds exposure will have a similar result to a 11 minutes exposure in the normal system. The downside is that you lose a lot on magnification, so if you have a very tiny object, it might not be a good idea to use the Hyperstar. The CCD camera, is another very important component. It is basically a digital camera made for astronomy, so there is no shutter, no lens, no nothing. All controlled via computer and with a amazing cooling system. 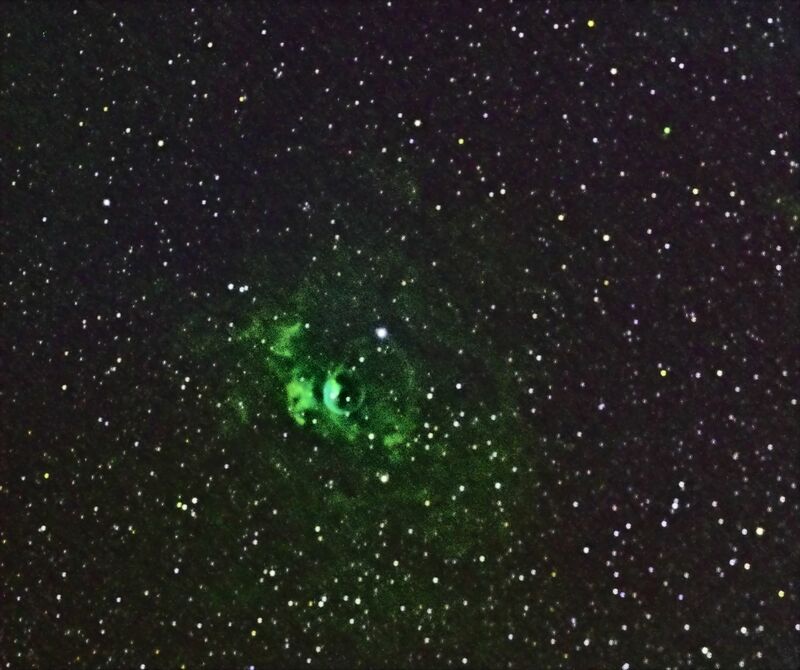 The Atik 450 camera that I got can go to -20C decreasing greatly the amount of noise generated by the camera. The “downside” of this camera is that it is mono… there are CCD color cameras, but they have less quality and less light gathering power. So to deal with this problem, it is necessary filters. I got the conventional LRGB (Luminance, Red, Green, Blue), and I got the narrow band Hα (Hydrogen Alpha), OIII (Doubly Ionized Oxygen), SII (Ionized Sulfur). 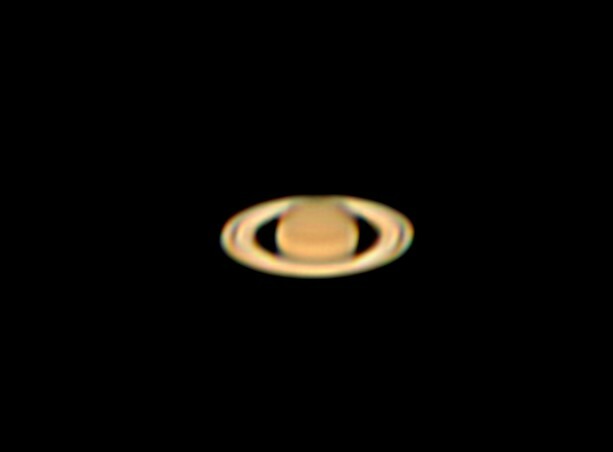 So, for my first light, I did a very bad job at aligning the mount, didn’t use any autoguiding, and took some pretty short exposure pictures. Just to see what I could get. Tried to find something big and easy to photograph, only as a first test. Weather was not very good so I would not be able to have a nice night of pictures. Only 500 seconds total (less than 10 minutes) and the session was finished with 50 shots. Had to change filters 4 times, one for each LRGB. It took me almost the same time to prepare the next filter than to take the pictures with the previous filter. It is unbelievable fast system. And even in one only sub, I already see a lot of details of the galaxies. 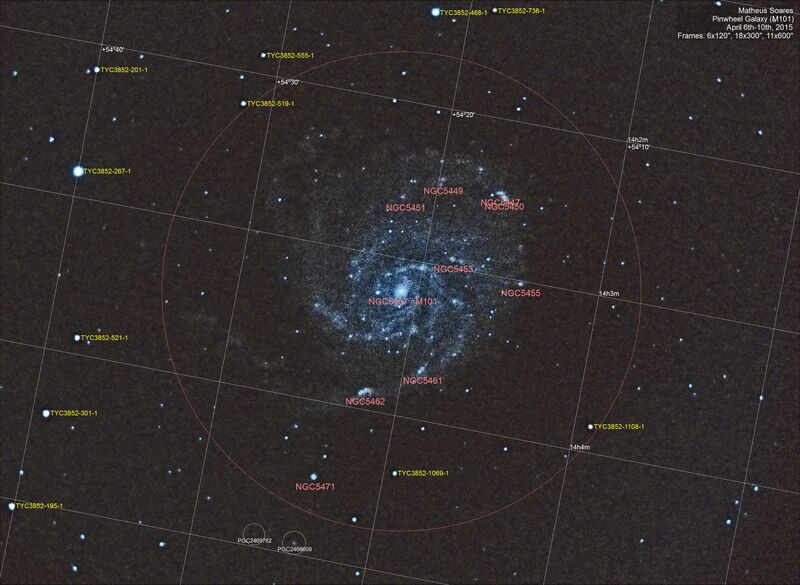 Next time I will do the proper guiding, proper alignment and try some pictures a bit longer. And see what will be possible to get. I am very happy with the new acquisition, and looking forward to may pictures in the near future. There is a long time I don’t have such a great night. From dawn to dusk no clouds, no wind, perfect. And now that I learn to use properly the autoguider, i can do very long frames. 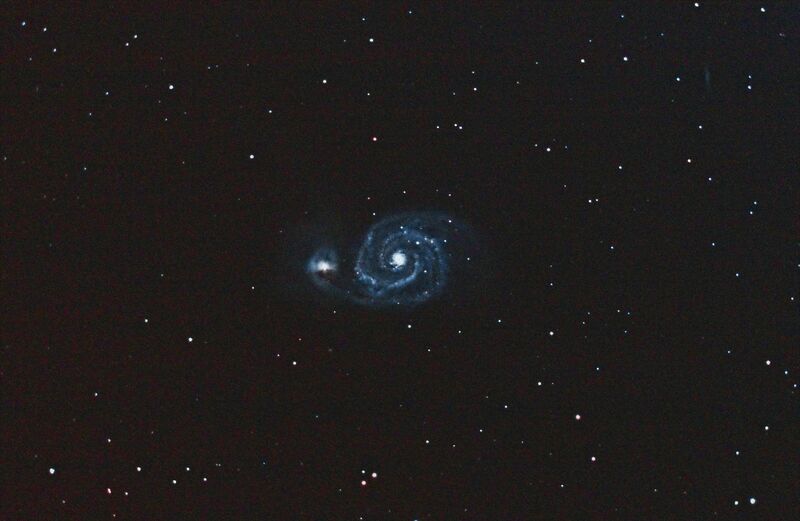 So I setup to get some shots at Whirlpool Galaxy (M51). It is a very beautiful merger galaxy where the bigger is feeding on the smaller one. I manage to have some very good aiming and tracking. And everything seems great. To take 20 frames of 10 minutes it is almost 3 and a half hours. After my first picture I was amazed. I could clearly see the galaxy without any editing. Just the raw one frame was there a beautiful galaxy shape. But I notice that after a while, I couldn’t see it as good anymore. I thought it could be some passing clouds? But there was none. Maybe it get some good and bad frames? But the quality was just degrading with time. Since my target was to pass at Zenith and I would need to do a meridian flip. And after that was not possible to find the galaxy again. And it was late so I decided to stop the process. I had taken 14 from the 20 shots, it was good enough for a day. But, I am aware that my corrector plate is always getting dew. And I could do the math. Dew + time = each shot has less light passing through. So in the end, my 14 shots are useless. Because of the annoying Dew. I made a GIF to show what happen. Each frame of the GIF is one of my frames, raw data, not processed. 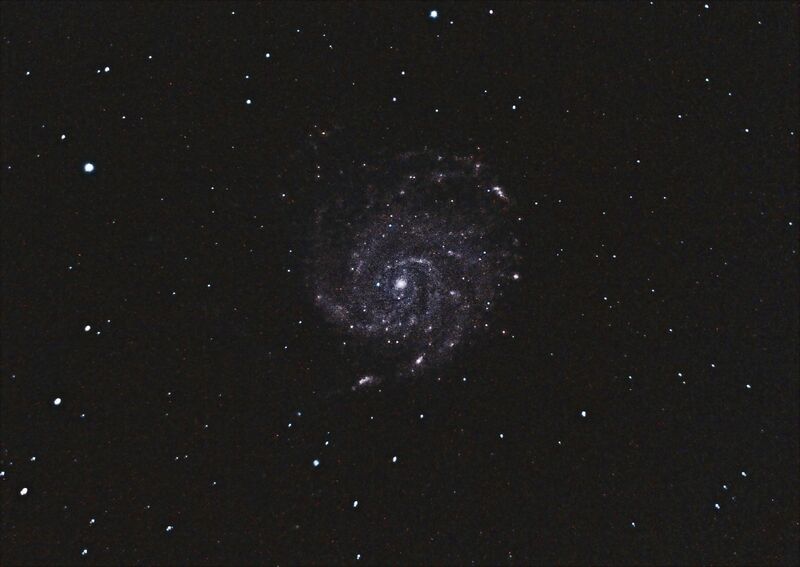 It starts as a nice galaxy, and finishes as a small dot. Luckily I already have a Dew shied (which delays but don’t avoid it to happen), and in the way there is a dew heater band, to be able to end this horrible nightmare. Note that the sky looks blueish, it is because of light pollution of the sky, which lit it up very bight for long exposure pictures, in combination with a light pollution filter I always use, to avoid that the picture is just a completely orange and no galaxy or stars can be seen. 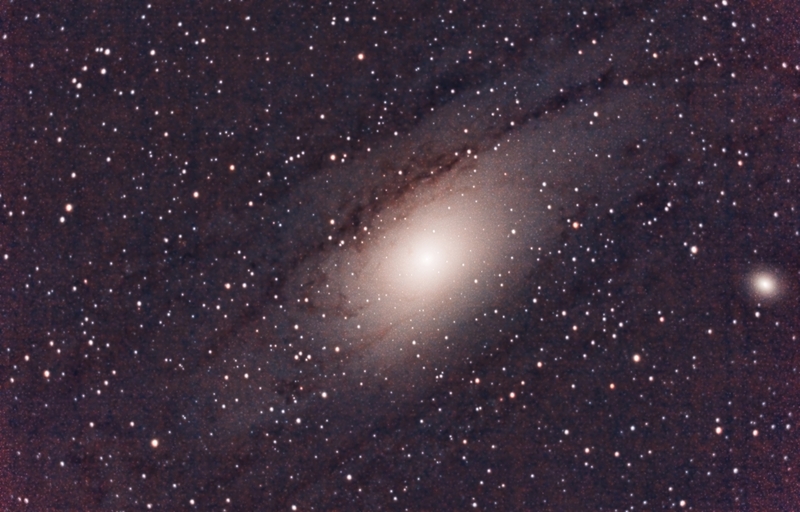 A while ago I took another picture of Andromeda Galaxy, using the telescope. My previous picture was only with the zoom lenses. Eventhough I knew Andromeda didn’t fit on the picture frame, I thought it would be a good idea to make it with more details. First post-processing I did looked very nice, but i found out in the last steps that there was some very nasty artifacts on the picture. Seems like when reading one for the shots, the external HDD hiccup and corrupted the data of one file, messing up the result. So I had to re-process everything, and the second result is not as pleasing as the first. Anyway, lately I am trying out Maxim DL. Pretty powerful piece of software, can control everything from the camera, telescope, autoguiding, to weather station, dome, focus and filters. It is not easy to use, but I am trying it out. 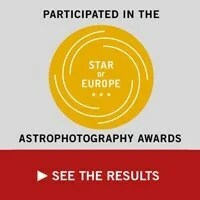 And doing so, I discover some nice algorithms that analyze the picture and find where in the sky it is. And it seems that Pixinsight also have one of if. So i tried to Plate Solve my image, it finds the celestial coordinates the picture belong, and then Annotate the image with a celestial grid, and some data of what is inside it. The annotation can be very simple, as it is in this example, or very detailed. With star names, constellations, and much more. Not all my pictures works to Plate Solve and Annotate, maybe because they have always too much field rotation. But it is a nice feature.